Fall is almost here! This is the time of year when my oven starts making the transition from being a horrible piece of hot metal to an amazing appliance that produces delicious things and keeps me warm in the kitchen. One of the first ingredients I think of for the fall is pumpkin and Isa Chandra Moskowitz’s Best Pumpkin Muffins recipe is the best way to enjoy any of it that’s canned. These are super-moist and not too sweet. 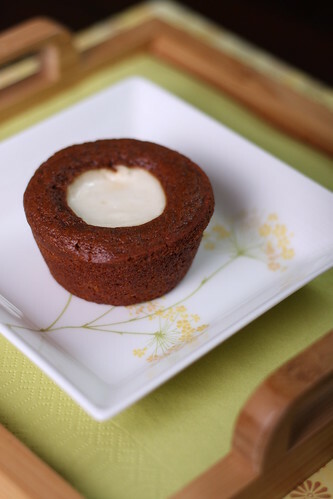 The last time I made them, I added a little half-sphere of Tofutti cream cheese to the batter with a delicious result—whether or not you add in the cream cheese here, you’ll still be rewarded with a perfect and delicious muffin. Make Isa’s Pumpkin Muffin batter. Spoon into a greased muffin tin. Using a tablespoon, level some Tofutti cream cheese to make a perfect half-sphere. Place the half-spheres on top of the muffins and bake according to the recipe instructions. I love this! That muffin looks so delicious! Good Gravy Beans! I just made these to take to a friends house for dinner tonight. They are INSANELY good!